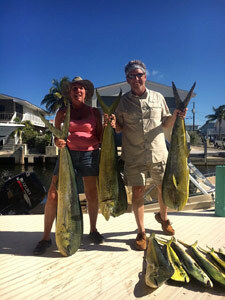 From late Spring through Summer Dolphin inhabit the offshore waters of the FL Keys in abundance, and become one of the primary recreational fishing targets. Best described as hard fighting, aerobatic, and very tasty. The life cycle of dolphin is quite remarkable. Dolphin are extremely fast growing, but short-lived. Most dolphin only live a year or two, but the oldest fish can live up to around 4 years of age. Maximum size attained by can be up to 5 or 6 feet (1.7 meters) and almost 90 lbs (40 kg). Dolphin fuel this fast growth rate, in excess of 3 feet in the first year, by eating mostly fish, particularly flying fish, mackerels, jacks, leatherjackets, and occasionally other dolphin. Dolphin are also capable of spawning during their first year of growth and may reproduce several times during a single spawning season. Other than trolling for dolphin, most the fishing can be labeled ‘live baiting’. A day of live baiting starts off with Capt. Jim catching fresh live bait early in the morning, before your charter begins. Capt. Jim will not waste your fishing time searching for bait. With the live bait secured, there are several methods that can be employed: slow trolling, drifting and/or kite fishing. The method chosen will depend on the species being sought and the local conditions. Slow trolling is where the live baits are a trolled at a very slow speed. 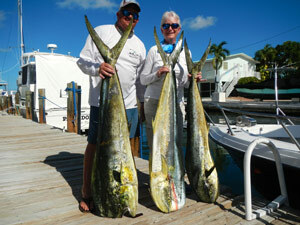 The act of trolling allows your baits to cover a larger area in search of game fish. The baits are trolled slow by necessity to keep them from drowning. Live baits trolled too quickly will lead to their quick demise. As the name implies, drifting is a method where the baits are deployed as the boat drifts over a productive fishing area. If the conditions are favorable, drift fishing can cover as much area as slow trolling – and without the noise from the boat engines.